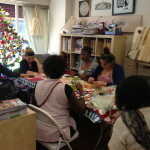 “The Garden of Aspirations” is a craftivist art installation of and for the people of Waltham Forest East London. It is composed of a number of elements, all made with and by local people in reflection about what would improve our community. 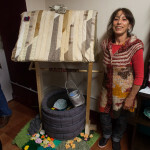 In 2012 as we envisioned a new kind of community space – made by local people using the skills and talents we usually sell farther afield – and celebrating the health and social benefits that come from crafting, we worked with artist Harriet Hammel to sculpt our “Community Wishing Well” and raise funds to create the space we described. In 2013, we began sharing our wishes – even when they felt like “just a drop in the bucket.” At our grand opening we shared with people our idea that the first step in making change happen is finding the courage to articulate what it is you want to happen. That doing so helps call others with the same or shared dream to you. We asked people in our area – an area experiencing significant change physically, economically, demographically, and socially – ” What do you wish for our community?” and to write them on a fabric water droplet. The droplets become a wellspring. 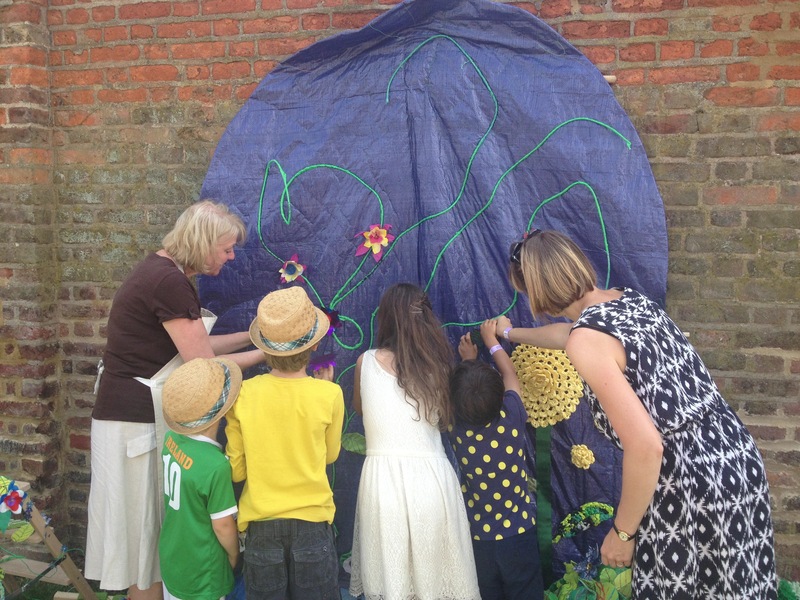 In May 2014 spring the children of Barclays Primary and our After School Craft Club created the “Treehouse in the Sky” Tree of Life with our volunteer artist in residence Sheila Hallisey while discussing the environment. Made entirely of plastic and bottle tops, this piece is not only evocative of the Mexican Tree of Life, but also the Hindu God Shiva and with its vibrant colours, tropical idylls. 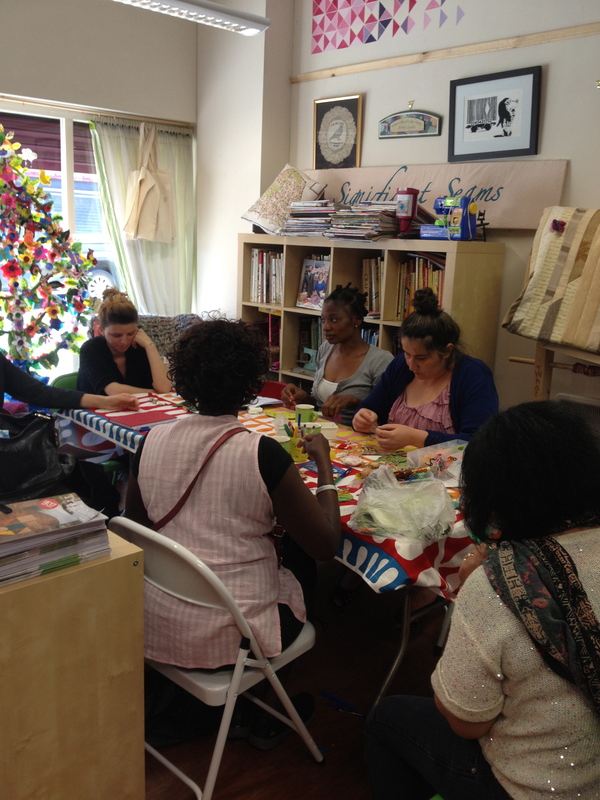 During the same period, the women of our Sew & Tell ESL programme have practiced their English whilst making the leaves and flowers of a hedge. Over summer 2014, we made the horizon for our wishes – using only what we have: donated fabrics and threads, plastic carrier bags and our growing community and our imagination. 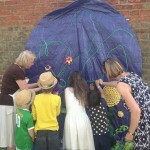 We are quilting a tarp with blossoms into the backdrop to give the garden a home. Our water droplets are becoming bunting for our garden so we can see, share and reflect on our collective wishes. Wishes that seem actionable are being forwarded to our local council cabinet holders and relevant community organisations, and ones that just make us smile- like “saving the unicorns”, well we’re sharing the smile via social media. One wish sent to a local Councillor, for a community garden and new play area on a specific site, has already been advanced towards reality. The Garden of Aspirations is a project about empowering people to find and use their voice – and understand the perspectives of those not always heard, despite our democratic world. We know illness, poor judgement, and inequities sometimes soften the voice of survivors, despite the insight and experience they have. Bad luck and low self confidence disadvantage many too. So, we are interacting with the wishes. We are listening and trying to help make positive change happen. We believe that believing a wish can come true is a critical next step in helping a whole community find their voice and shape their world. Offering a bit of leadership and knowhow developed through experience empowers everyone. 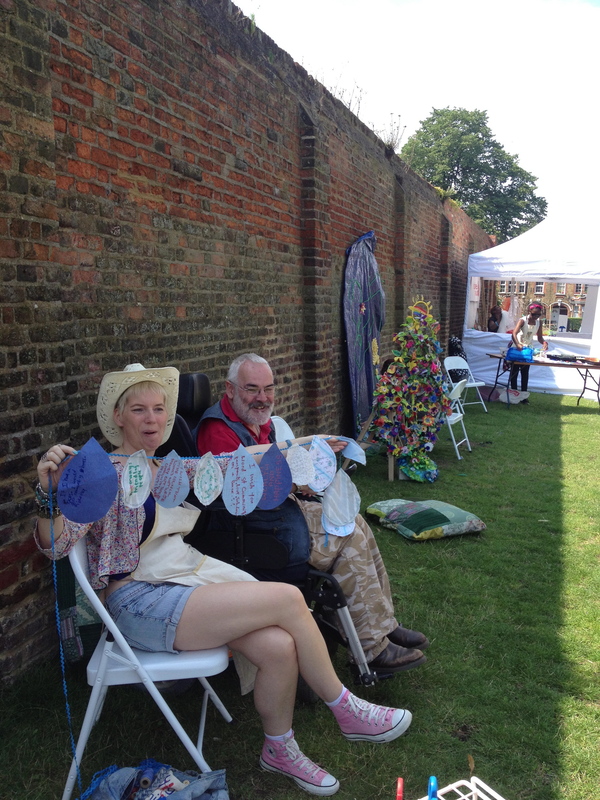 We brought the Garden of Aspirations to Walthamstow Garden Party, Walthamstow Village Festival , and Wood Street Festival, and as summer faded and our local bounty of apples became ripe we sculpted a tree for the garden, and then as the leaves fell, crocheted wistful snowflakes for it. The wishes and responses we received help inform future projects. Thank you for sharing your wishes with us. 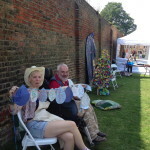 The wishing well and the raindrop bunting can be rented, and workshops using them can be commissioned. Contact us for more information.